Red Bull have warned their rivals that they aim to defend both the drivers' and constructors' titles in 2011 ahead of the season-opening Australian GP. "We are keen on getting the feeling of last year, winning the championships," said world champion Sebastian Vettel. 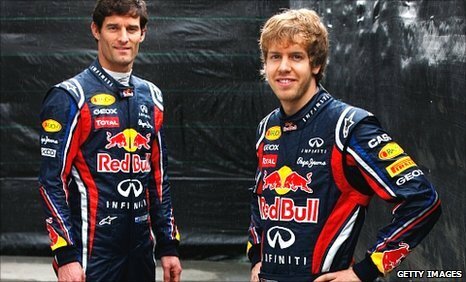 Team-mate Mark Webber added: "The bar is set high this year - we're looking for both championships." But Ferrari's Fernando Alonso stated: "If you race for Ferrari, the goal is fighting for the championship." After four pre-season tests, Red Bull and Ferrari look primed to pick up where they left off in 2010 as the two fastest teams in the field. Vettel's victory at the Brazilian Grand Prix gave Red Bull their maiden constructors' crown and a week later he triumphed at the season-ending Abu Dhabi Grand Prix to become the youngest F1 champion. He finished the campaign four points ahead of two-time world champion Alonso, with Webber 10 points further back in third. "Our target is to continue the way we finished, we won the last race and had a strong performance there and we will try to carry that momentum into the new season as well," stated the 23-year-old. "My number one priority is to win races and race at the top of the field. I don't have to lie to you, the target is to win. "If you come here as champions of the last year then you want to keep on winning, that's what it's all about. I'm looking forward to a good weekend. "I like to come to Melbourne and I really like the track. We don't really know how competitive we are but we are quite happy with what we did in the winter and the car has been reliable. "If that's enough - we won't get to know until Saturday or Sunday in the race. I don't know if we are in a position to say that we can win the race. We have a good feeling but still we need to see how strong we really are. " Red Bull have yet to finish on the podium in Australia and Vettel's best result at Albert Park was 13th in 2009. The German qualified on pole position last year and led the grand prix until sliding out of the race with brake failure. Webber's career-best performance remains two fifth places when the Australian raced for Minardi and Williams. "Sometimes there are tracks that are like that but hopefully we'll have a clean weekend and have a good result here," said the home hope. "Hopefully we can build on what we did last year. We want to be there at the end [of the season], no question about it, that's the goal for the team." Alonso has won at Albert Park's challenging circuit three times and is expecting a season of surprises and has even described the Melbourne grand prix as a "race to survive". "The first race of the championship is always very exciting," added the Spaniard, a double world champion with Renault in 2005 and 2006. "[But] the first of the championship is sometimes a race to survive. Hopefully we will score some points and start the season in a good way. "Now is impossible to say what the order is and who will be competitive or not. "On paper there are six teams who can fight for races but after three or four races then you will see there will only be two or three who can fight for the championship." Meanwhile, ex-Ferrari driver Michael Schumacher is optimistic he can challenge for podium finishes after a disappointing return to the sport with Mercedes last year. Schumacher came back after a three year absence, which followed an 11-year spell with Ferrari, but failed to finish in the top three all season. The new Mercedes was plagued by reliability problems and a lack of pace in early pre-season, yet a series of upgrades helped Schumacher set the fastest time in the final test event at Barcelona's Circuit de Catalunya on 11 March. "Mercedes has done a huge step forward with this year's car, it's a very performance-orientated car and it has paid out," said the German seven-time world champion. "I think this year our target and our realistic possibility is to fight for podiums and if things go very well, maybe to win a race. "Does this put us in a position to fight the championship? No... if it comes, and the opportunity will be there, sure we will try to catch it. "I think we have to see it step by step, where have we been last year, where can we be this year, and play it realistically, not unrealistically." The 42-year-old believes Mercedes will be among a pack shooting for second place behind Red Bull. 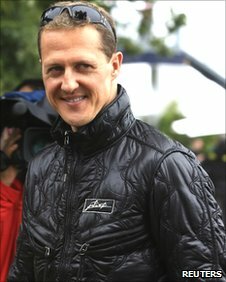 "I think we've got to play an important role just behind Red Bull, Ferrari, Renault," explained Schumacher, who will bid for his fifth victory at Albert Park on Sunday. "I see a good opportunity that we might be able to fight for to be the second fastest. This weekend it's up to us to prove it and I think we have a good opportunity to." In 2010 Schumacher was largely eclipsed by his younger team-mate and compatriot Nico Rosberg, who finished seventh but with almost double the points. "I think Nico proved himself last year, I think there's no doubt about this. It's going to be very tough for me," added Schumacher. "I'm still very confident I can match him. "The most important thing is to fight for the championship at the time that we're ready for it. To have a podium would be great but does it really change anything? No. Are we ready right now? No. Can we win a race? Maybe. "Would it satisfy me? Absolutely it would satisfy me. I would be thrilled about this, no doubt. It's all about winning at the end of the day."